NOTE: This article is for users who already have an existing SSL certificate (ie. purchased from another provider) and would like to install it on their Doteasy web hosting account. If you do not have an SSL Certificate yet, you can purchase one from Doteasy, and we will install it for you, free of charge. A private key is used to decrypt information transmitted over SSL/TLS. When you install an SSL certificate on your hosting account, the first step is to generate a private key file that will be used specifically with the SSL certificate. NOTE: The private key is critical for the SSL certificate to work properly. We strongly recommend that you save a copy of your private key in a safe location. Lost private keys cannot be recovered and you may need to contact the certificate authority (ie. the provider/company where you purchased the SSL certificate) to have the certificate reissued. * If you already have an existing key, you will not need to generate a new one. Instead, you can simply upload your existing private key on to the Private Keys interface to add it to your server. 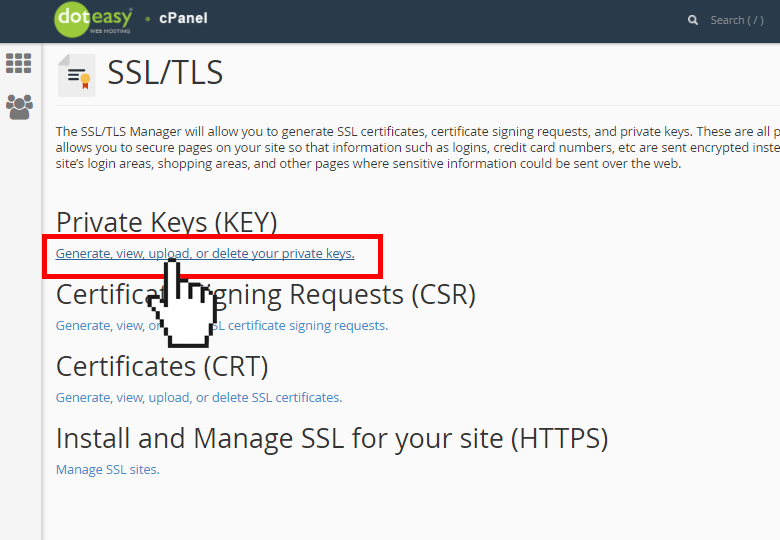 Under Security in cPanel, click on SSL/TLS. 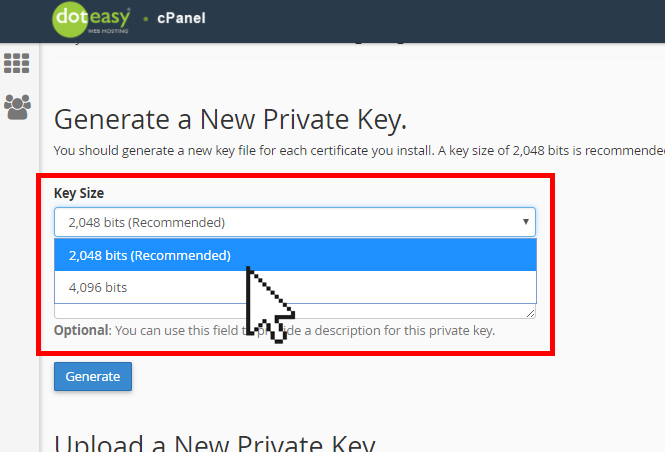 From the SSL/TLS Manager, click on Generate, view, upload or delete your private keys under Private Keys (KEY). 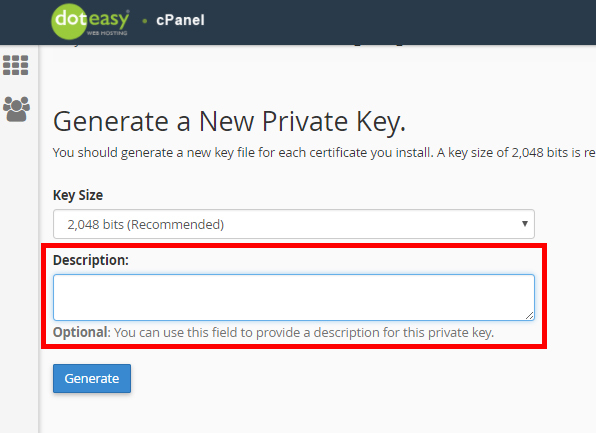 Under Generate a New Private Key, select the desired key size from the Key Size menu. When ready, click Generate. You will see a confirmation that the new key has been generated successfully. You should also copy the key and keep it in a save place. Click Return to Private Keys. This will bring you back to the Private Keys interface and you will see the new key added to the Keys on Server table.